This perennial is grown for its large jagged-lobed, slightly hairy leaves up to 8 inches long. 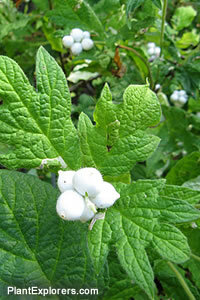 Insignificant perfoliate flowers are followed by white berries. Height 36 inches; spread 12 inches. For maximum freshness, please keep seed refrigerated in its original packaging until it is time to plant. Sow seed in containers and place in a shaded, protected spot outdoors. Grow in humusy well-drained soil in partial shade.